The 2015 Senior Camogie Final was the occasion for the launch of ChildFund and Camogie Associations ‘Dream Bike’ campaign. The Event was attended by Uachtarán na hÉireann Michael D Higgins, and Taoiseach Enda Kenny. 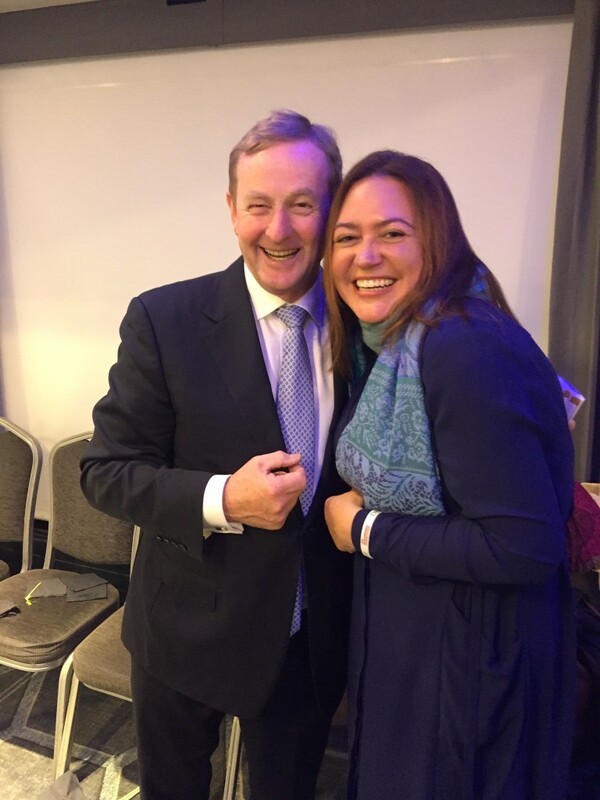 Taoiseach Enda Kenny shares a light-hearted moment with ChildFund’s Deputy Chief Executive Elena Lorigan. 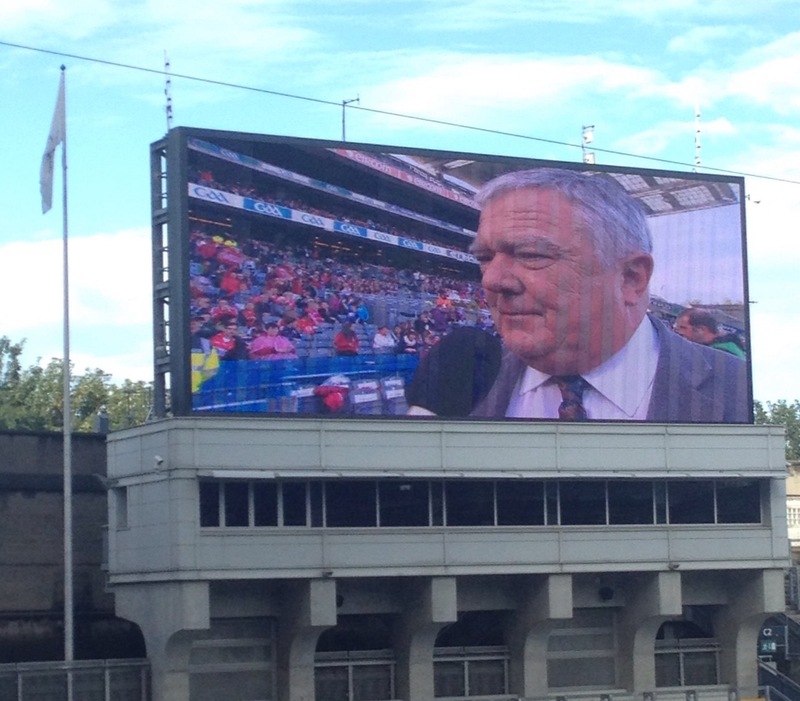 ChildFund Chief Executive Michael Kiely addressing the crowd at the Senior Camogie Final 2015, Croke Park, Dublin. Cork triumphed over Galway 1-13 to 0-9 in a pulsating Camogie final at Croke Park yesterday, however one might say the real winners on the day were the many girls we hope to provide with bikes as part of the Dream Bike campaign. The initiative, launched yesterday, is the fruit of our first collaboration with the Camogie Association since being announced as their charity partner of choice. ChildFund Chief Executive Michael Kiely addressed the crowd at half time to explain the huge importance of enabling girls to get to school safely. Dream Bikes helps us to empower girls to safeguard their education, and indeed their very health and well-being. The match was attended by another esteemed dignitary, ChildFund Alliance Secretary General Meg Gardinier. Meg was able to witness first hand the raw passion and commitment of Camiogie players and its rising popularity as a sport across Ireland. The occasion also provided an opportune moment to meet Uachtaran na hEireann Michael D Higgins and An Taoiseach Enda Kenny ahead of the hugely significant SDG Summit in New York on September 25th. As co-facilitators of the process (along with Kenya), Ireland has played a major role in the intense discussions leading up to the global summit. An Taoiseach indicated his intention to speak with Meg again, ahead of the New York summit, where ChildFund will press for the need to copper-fasten the rights of children as global citizens. 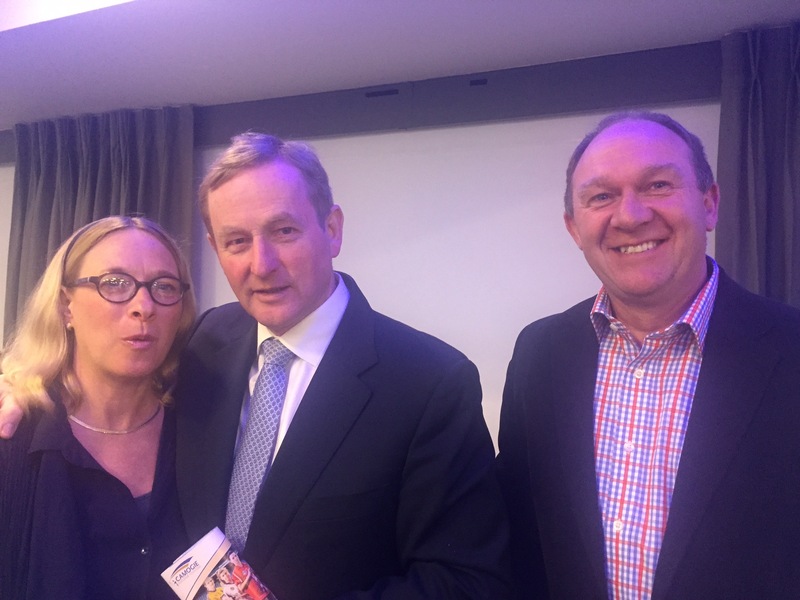 Meg Gardiner with An Taoiseach Enda Kenny and ChildFund Chairman Brendan Kenny at the 2015 Camogie Final, reception. 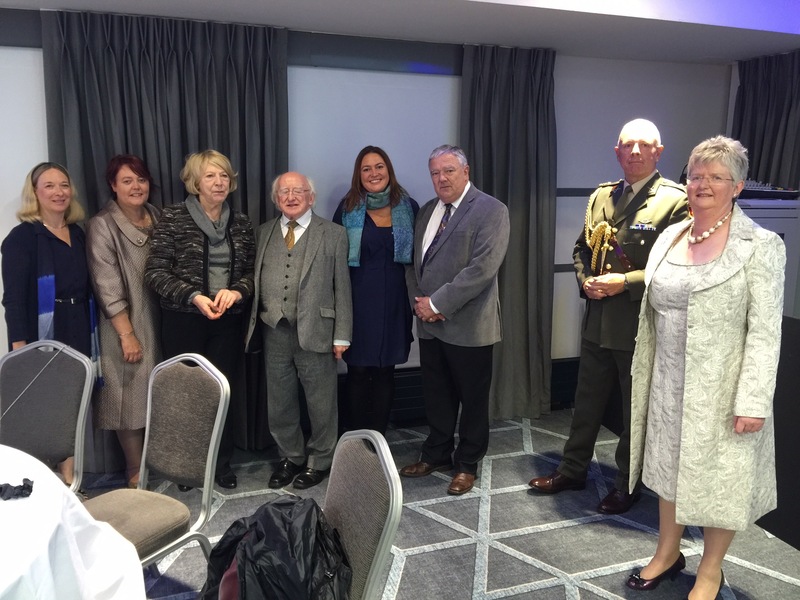 Camogie Association President Catherine Neary and CEO Joan O’Flynn pose with Meg Gardinier, Mick Kiely & Elena Lorigan of ChildFund, along with Uachtarán na hÉireann Michael D Higgins, his wife Sabina, and ADC. ChildFund’s partnership with the Camogie Association, it’s family of some 100,000 members, and the wide support it shares in communities across Ireland, is very much embedded in shared values of organic community development. It is for this reason we hope that the Dream Bike campaign is a huge success, helping us provide girls with the means to travel to school safely, and to dream of a fruitful educational path. We would like to extend a warm thanks to Catherine Neary, President of the Camogie Association, and all the staff and players of the C.A. for their hard work in helping us launch the Dream Bike campaign. The ChildFund Board of Directors would also like to acknowledge Chairman Brendan Kenny’s role in developing our partnership with the Camogie Association and his insights as a passionate and knowledgeable supporter of Camogie in Ireland. Please visit our Dream Bike page and find out just why this initiative is such a fantastic opportunity for young girls – and details of how you can help them on their way to a brighter future.